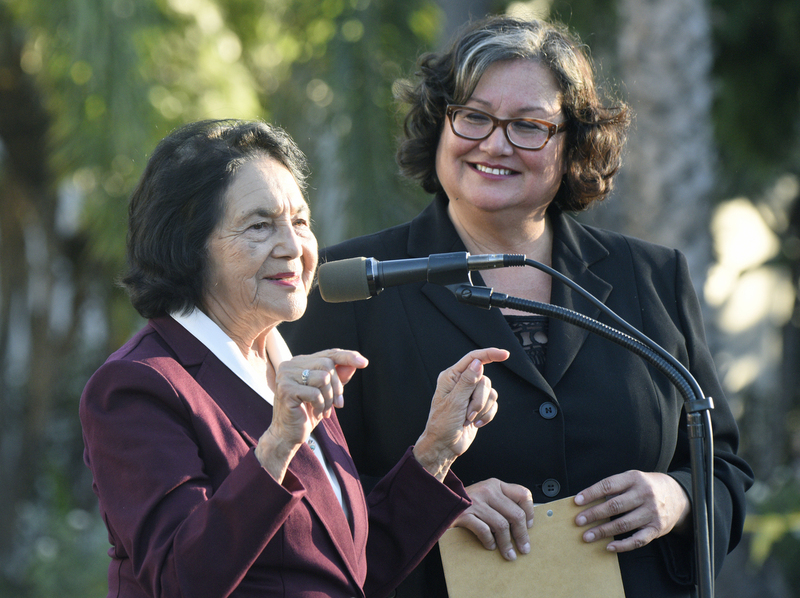 Iconic labor leader and civil rights activist Dolores Huerta stumps for mayoral candidate Cathy Murillo at October 27 rally in De la Guerra Plaza. We are urgently advising that voters cast their ballot for Cathy Murillo for Mayor. Cathy is and has been the most progressive candidate in this race and has effectively advocated for the interests of all members of our diverse community in her tenure on Santa Barbara City Council. As a Santa Barbara City Councilmember, Cathy Murillo showed political courage in standing up against a disastrous gang injunction policy when no one else would. Instead, she doubled down on funding youth programs and helped reduce gang-related activity in Santa Barbara. She has forged consensus in the community on issues from social justice to protecting our environment to creating economic and housing opportunities for working families. Among others, Cathy has received the endorsements of the Santa Barbara County Democratic Party, Santa Barbara Women’s Political Committee, Santa Barbara Democratic Women, Tri-Counties Central Labor Council, the Sierra Club, and CAUSE Action Fund. She has also received the endorsement of many locally elected officials including Congressman Salud Carbajal, Senator Hannah-Beth Jackson, Assemblymember Monique Limon and County Supervisors Janet Wolf and Joan Hartmann. In addition, she has been endorsed by civil rights leader Dolores Huerta and has received a 100% rating from Planned Parenthood. Due to the nature of the crowded race causing split votes across the democratic candidates, we are staring at the prospect of electing a mayor who has a record of advocating for racist policies, denying climate change, and representing only conservative interests. The only poll we have indicates that Cathy is not only the best person for the job, but the only candidate capable of defeating Frank Hotchkiss. As we look to make progressive gains on city councils across the country in Atlanta, Birmingham, and others, what kind of message will we send by allowing our city to move backward, not forward? Your support will make a difference on November 7 and Cathy will be a staunch ally in the political battles that lay ahead. Please join us in supporting Cathy Murillo for Mayor!